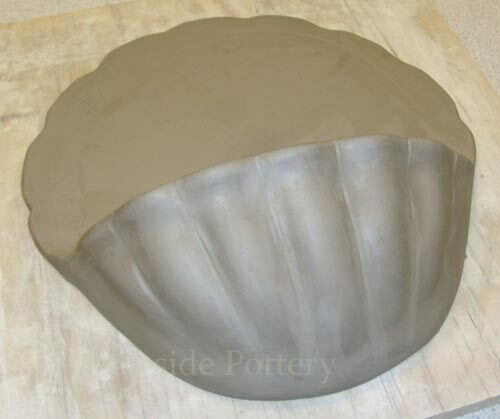 How to Make Large Clay Slab Construction Project Without Cracking or Warping? 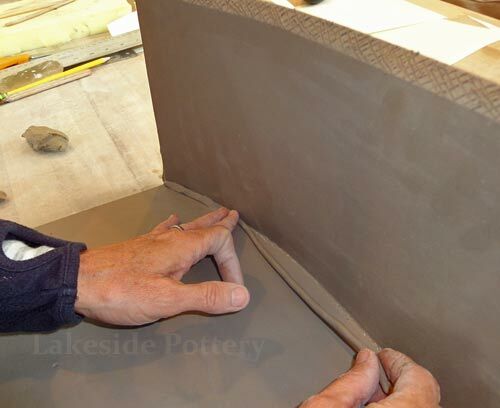 The slab project below is a sample of our commission work requiring large slab construction using cone 6 high firing stoneware to insure durability and longevity. 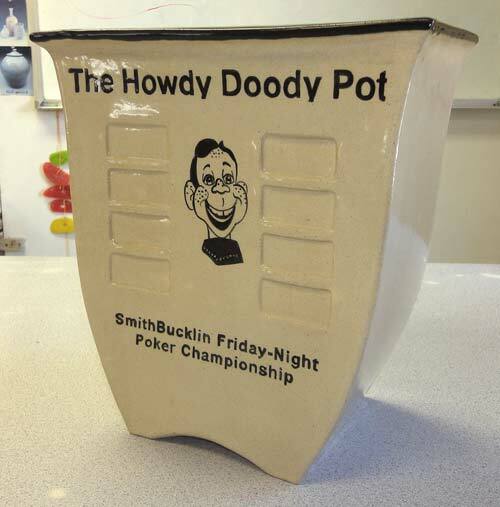 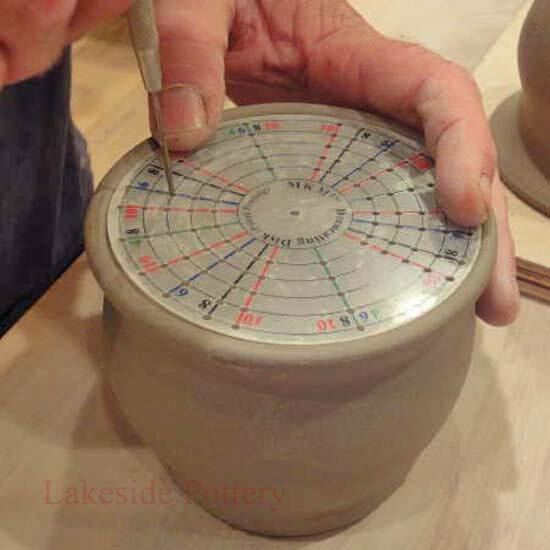 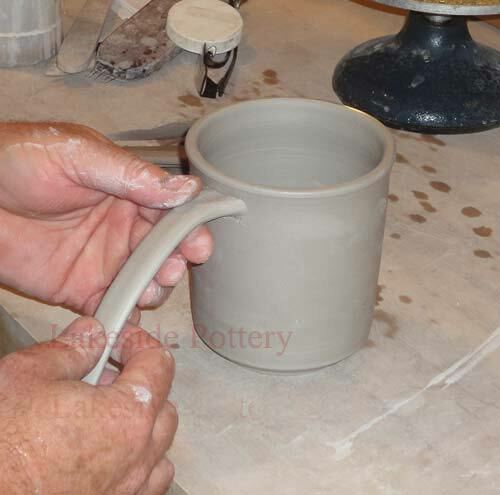 The "high firing" challenge is to eliminate or minimize warping and cracking that typically occurs due to stoneware clay's high shrinkage rate (12% +). 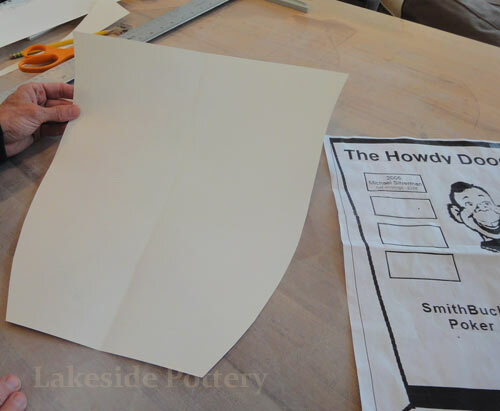 We took the opportunity to illustrate how to work effectively with large flat forms without cracking while minimizing warping. 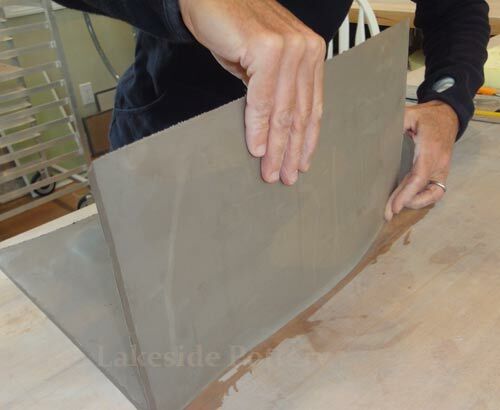 Large square-shaped slab construction can be frustrating. 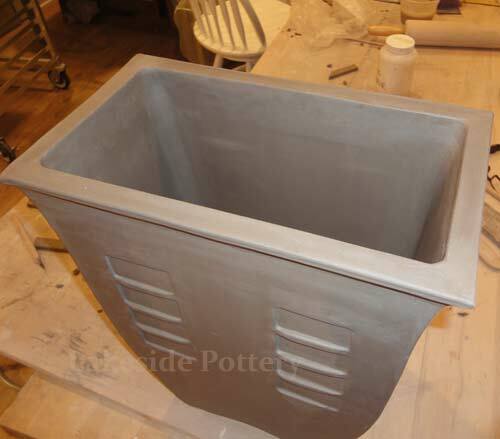 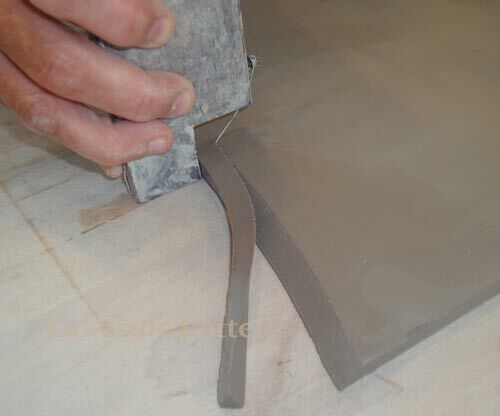 The key elements to success are: clay type (high grog content), how soft / hard the slab is in each stage of construction, slab is not too thin, use of miter cutting (45 degrees), using coil to round all slab connection points, use of magic water instead of slip, avoiding clay bending throughout the process, proper drying and firing schedule and kiln programing. 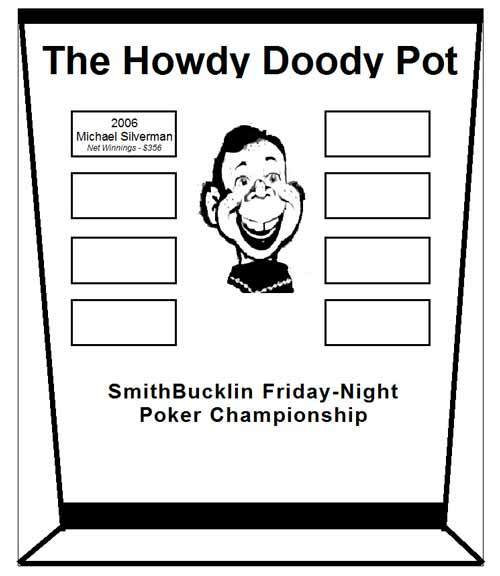 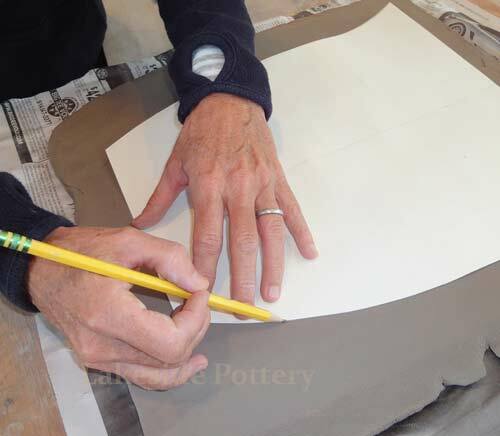 This project consists of two throphys that are ready to accept 16 winning plaques on each side with Sgraffito drawings and writing. 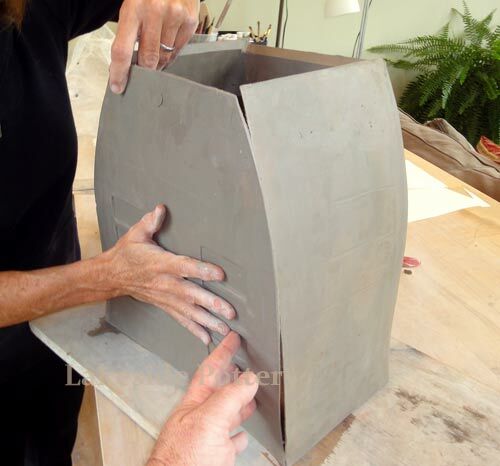 Finished product 16 x12 x 7"
Proposal revision three Face layout - Approved! 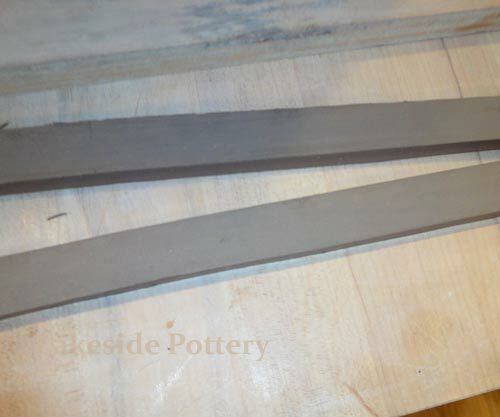 All connection points are required to be mitered at 45 degrees, scored and applied with magic Water (see link for magic Water recipe). 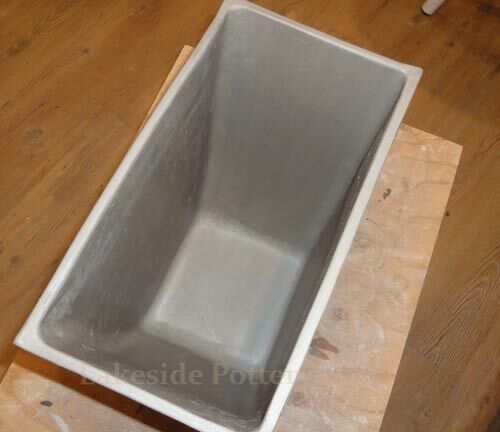 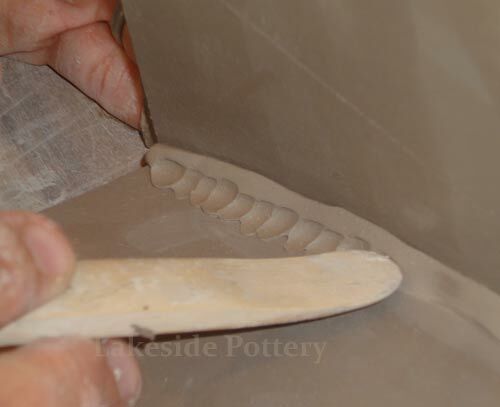 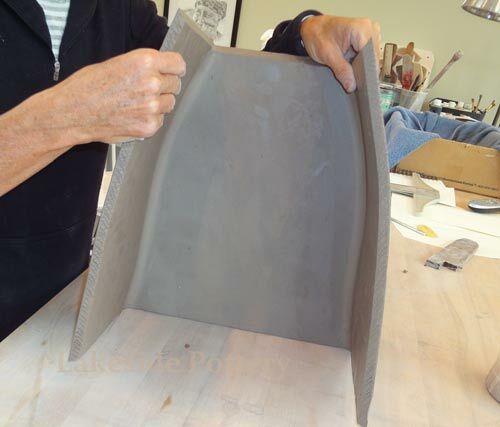 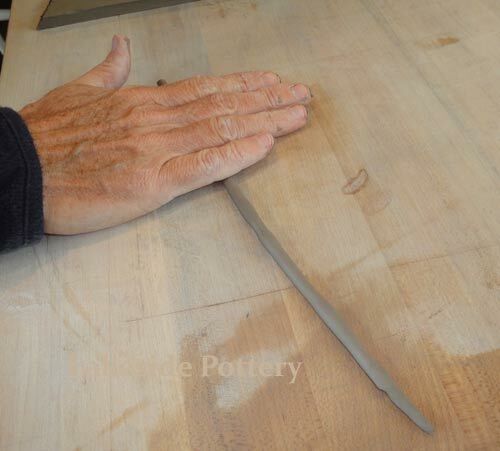 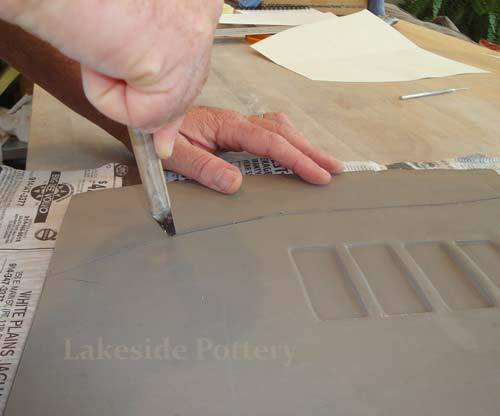 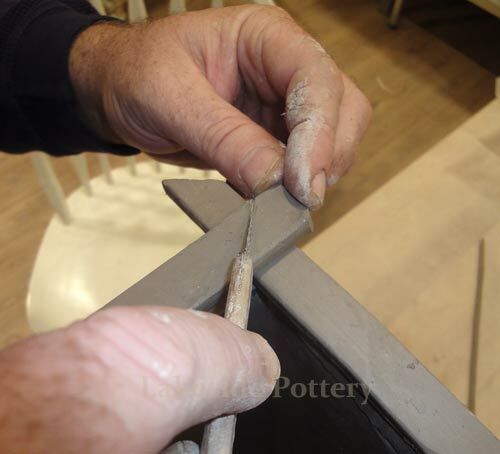 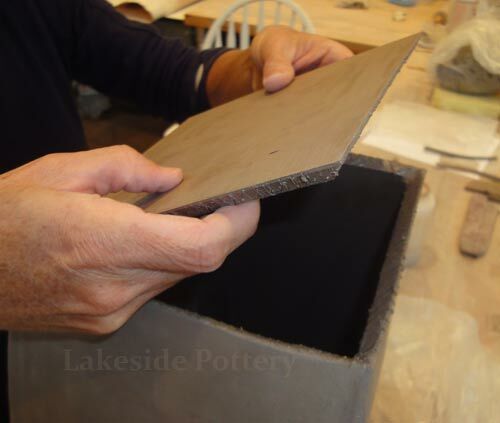 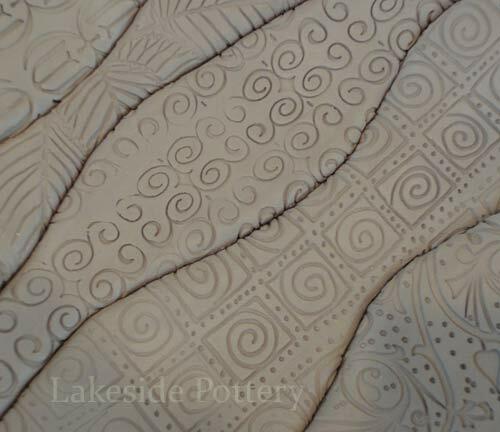 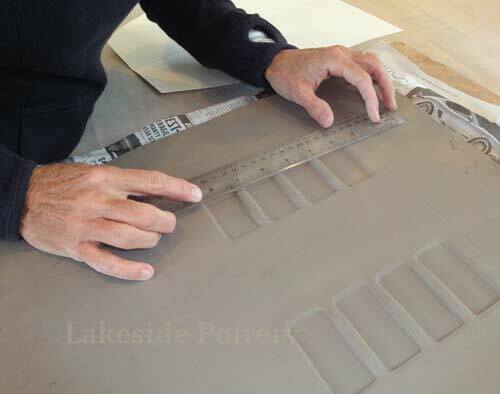 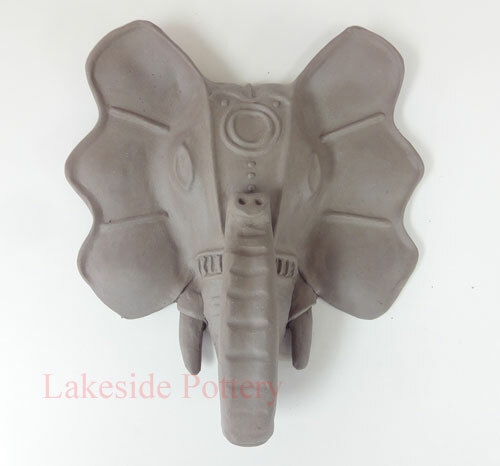 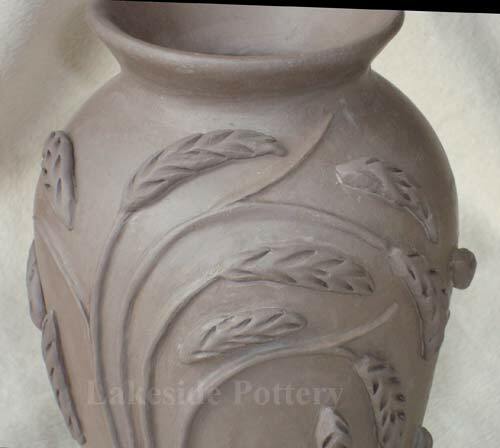 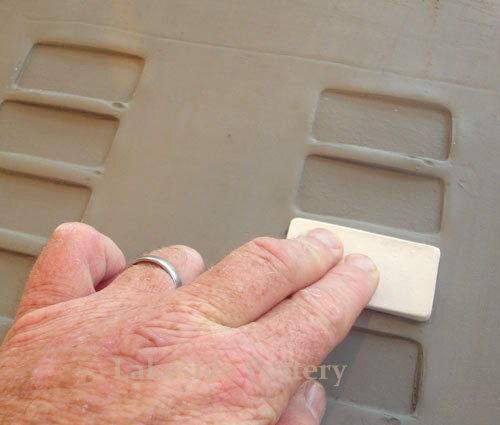 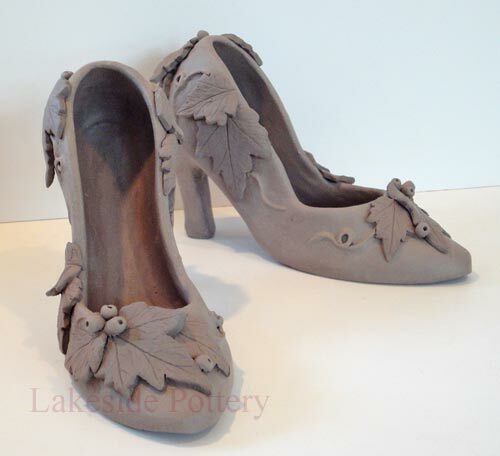 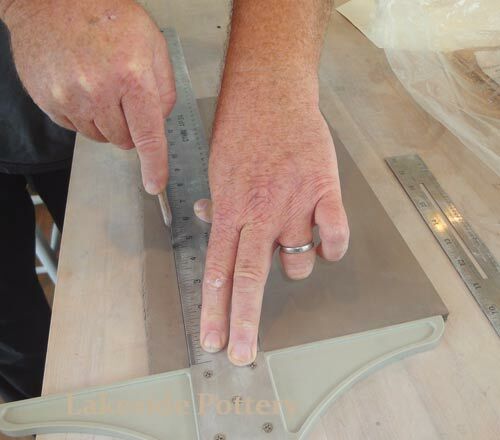 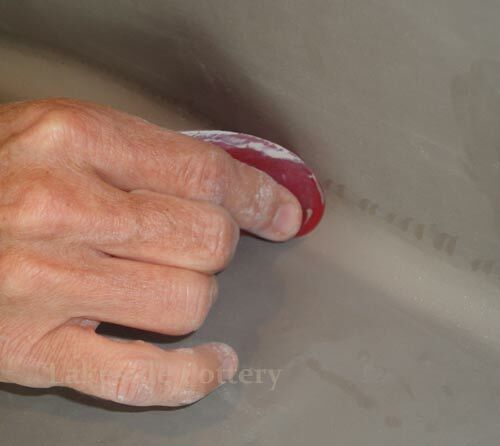 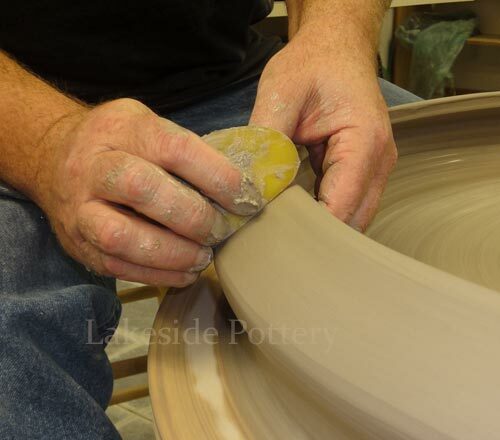 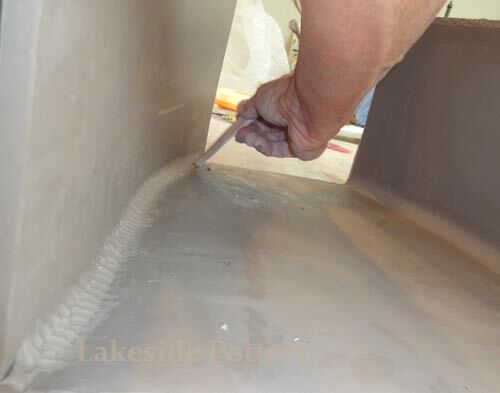 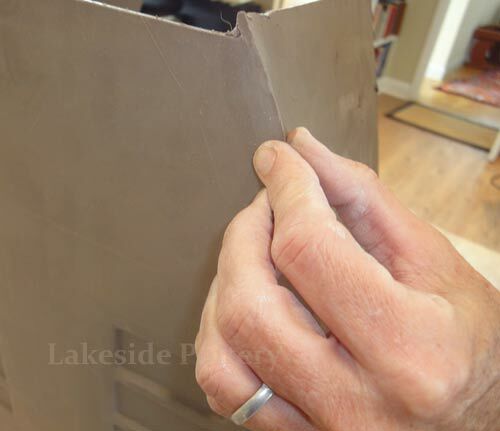 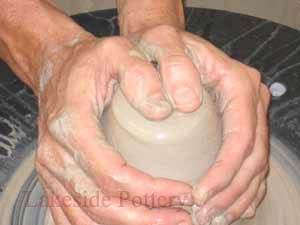 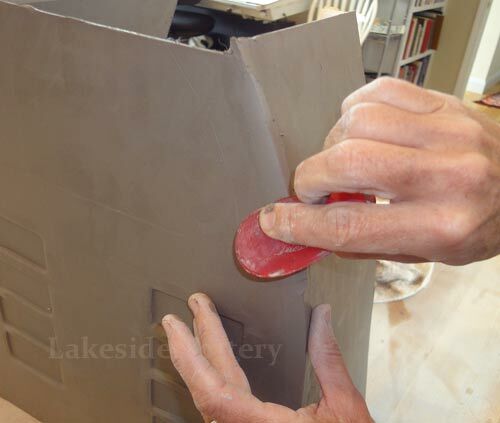 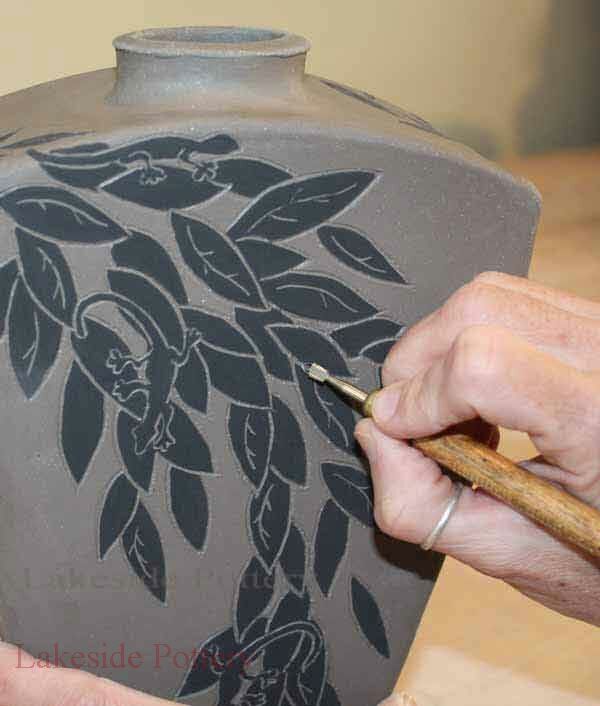 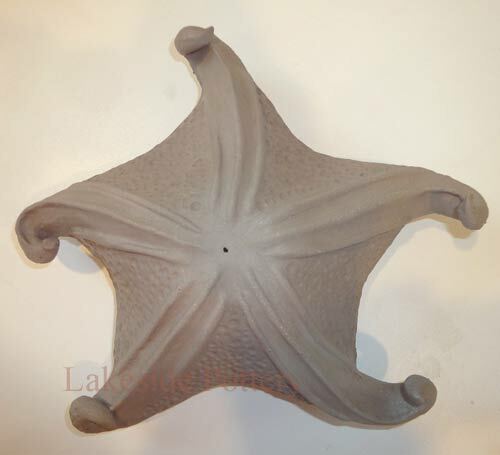 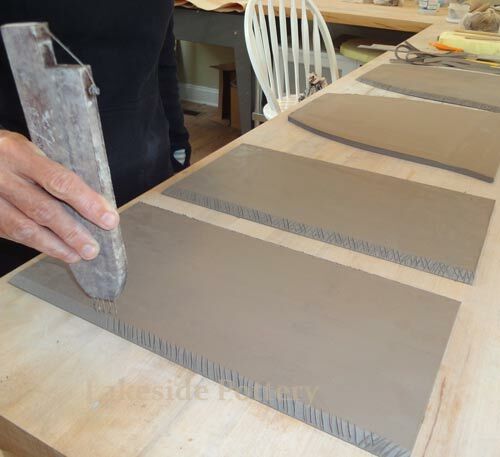 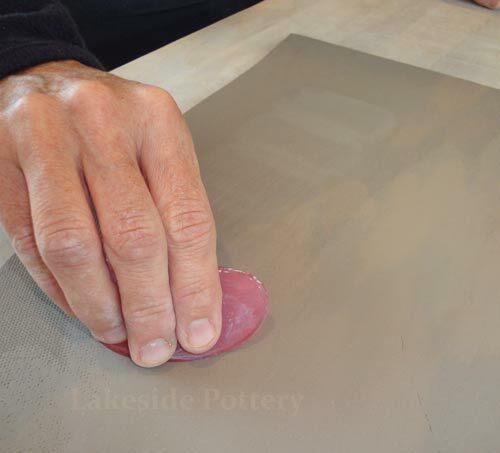 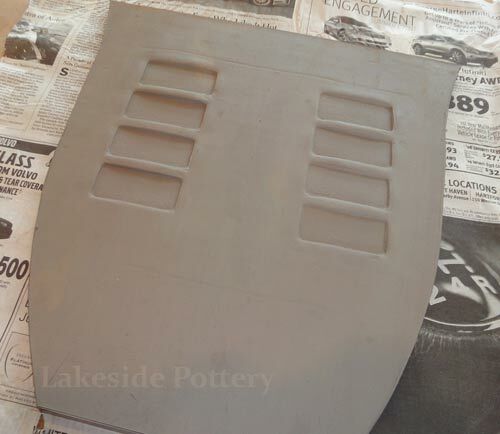 Using slip only may not be good enough for large forms and the seam might separate in drying or firing. 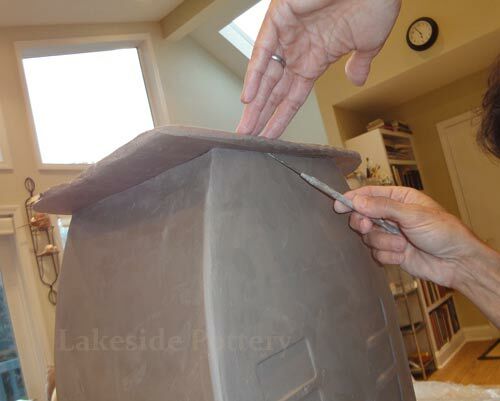 "beefing up" the rim is required to provide strength to minimize warping and to create a pleasing visual. 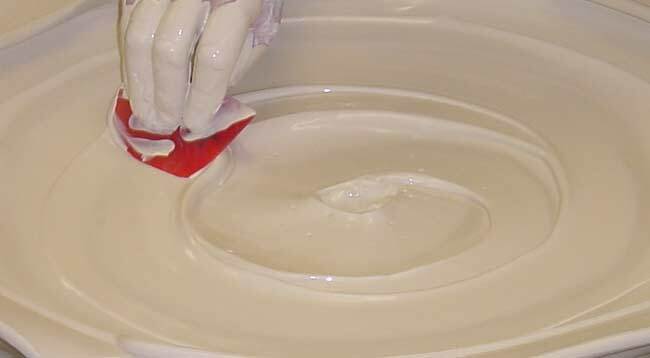 Drying slowly is very important. 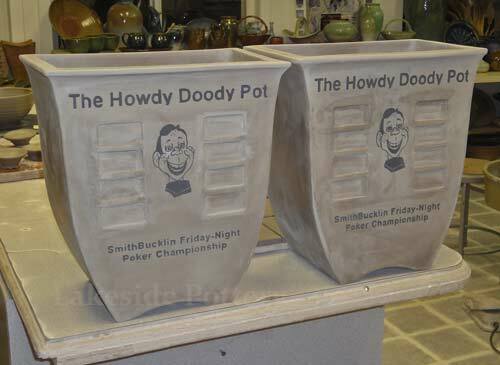 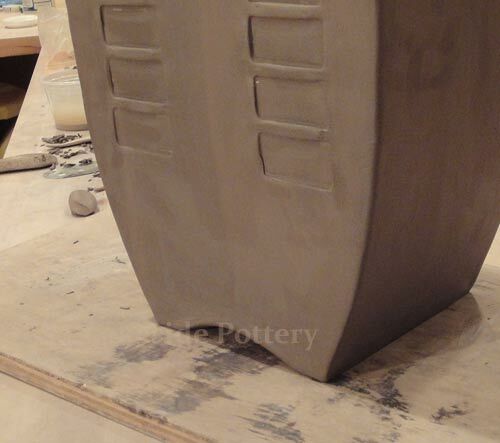 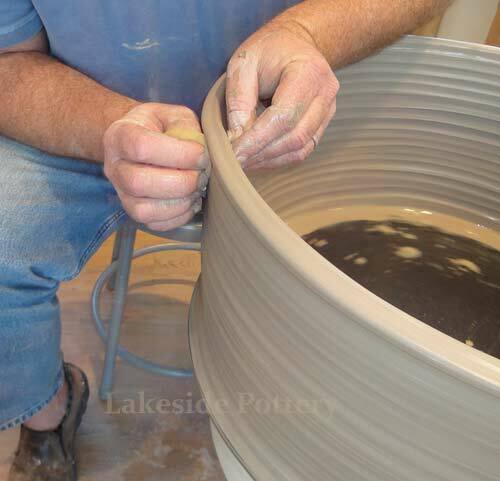 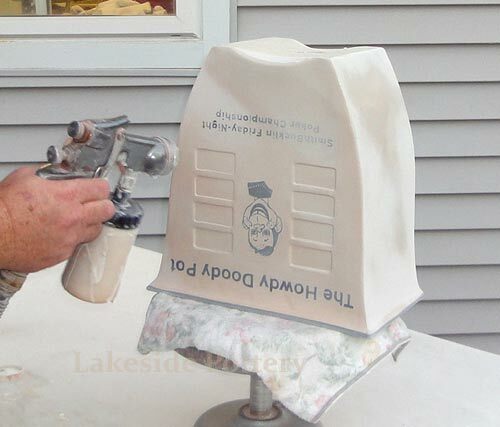 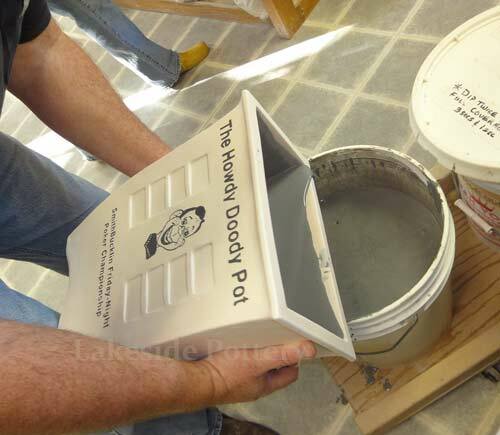 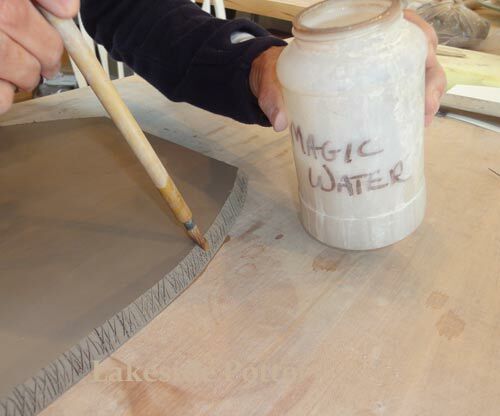 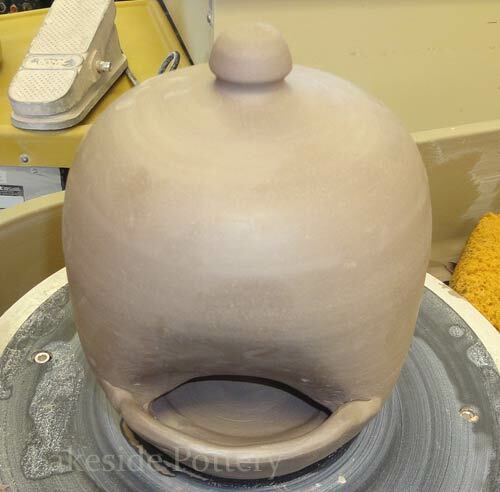 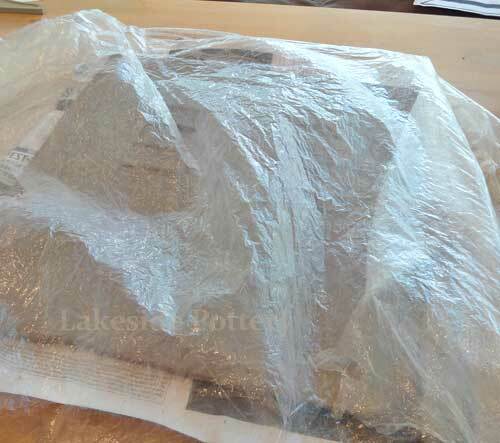 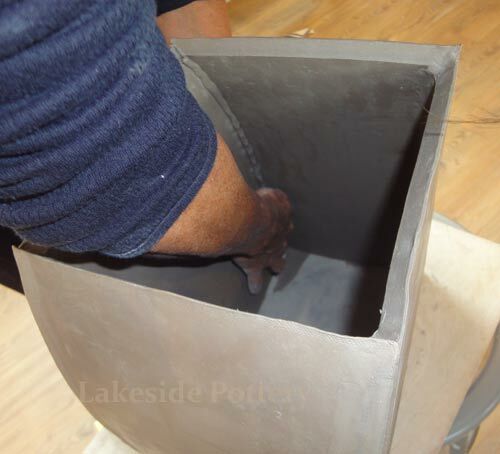 Cover the whole pot loosely for a week or two before letting it dry exposed. 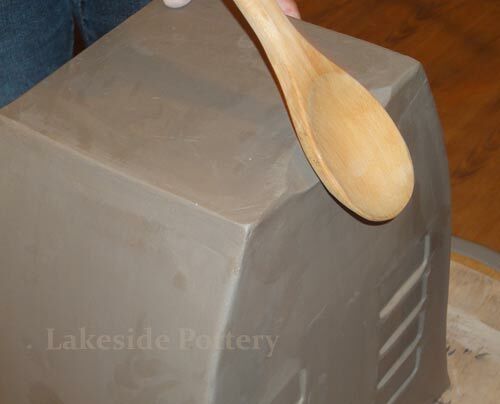 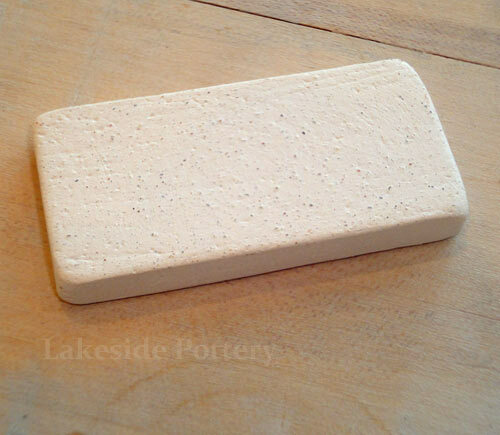 During the drying process, our clay will shrink 6% in length. 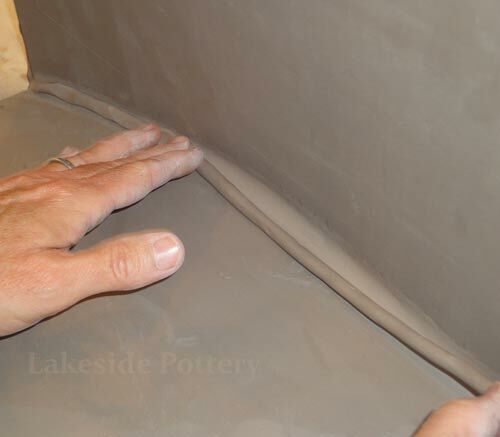 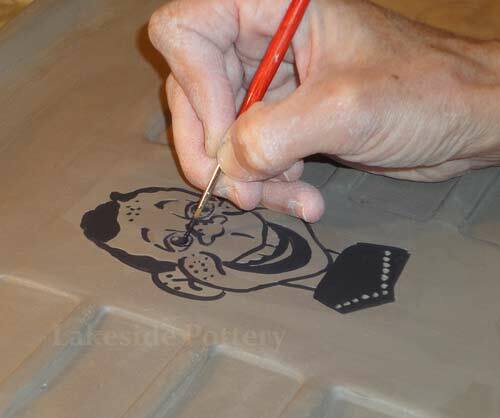 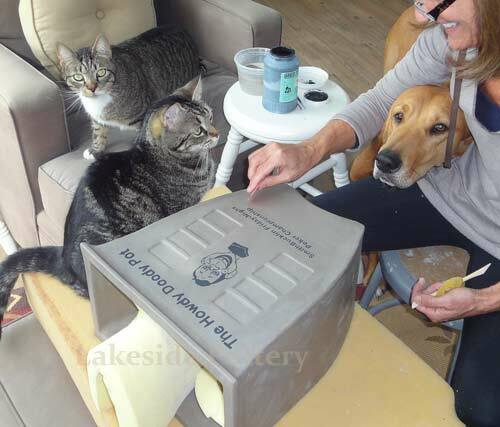 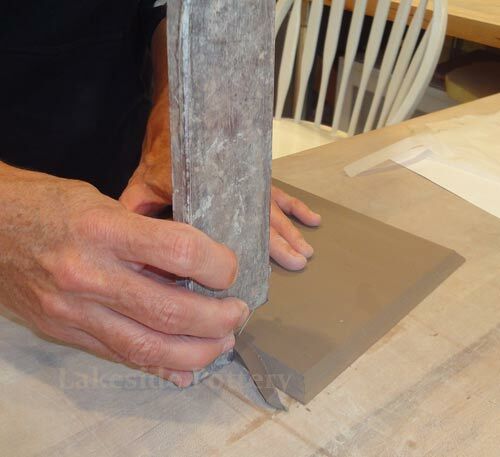 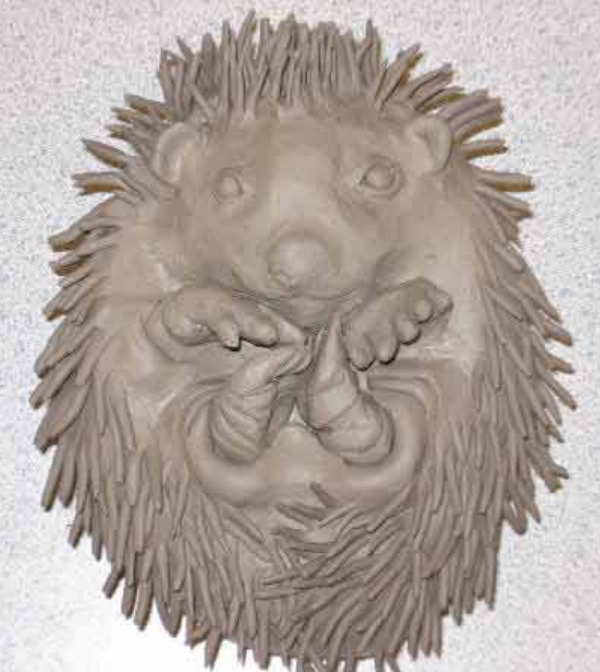 Meaning, a 12 inch clay length, will shrink one inch (8% in surface area and 12% in volume). 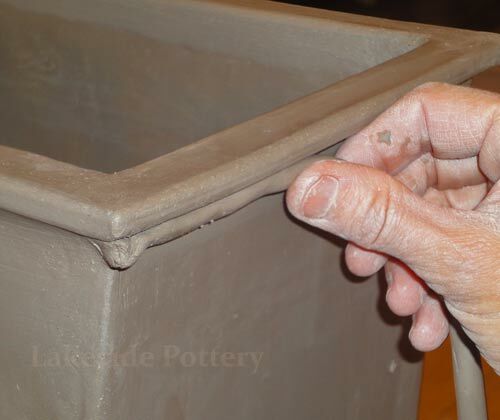 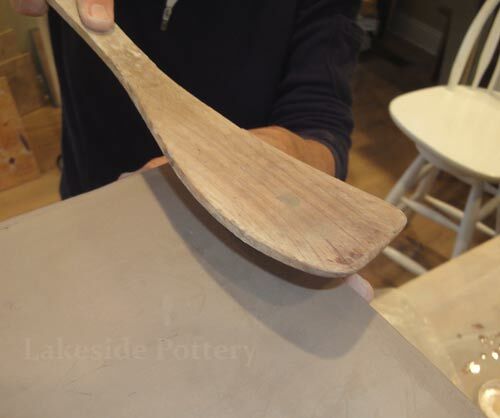 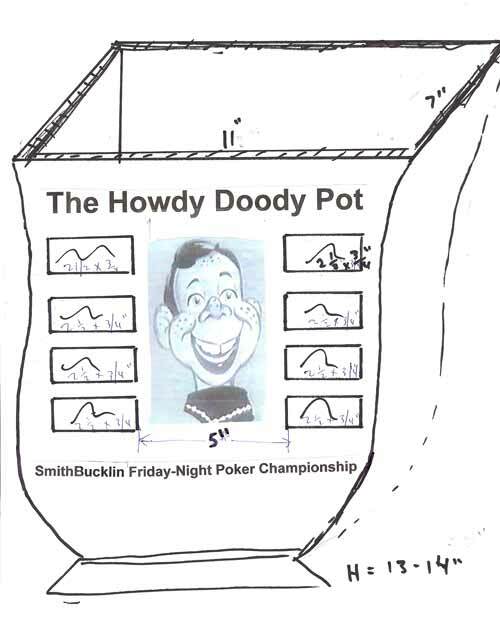 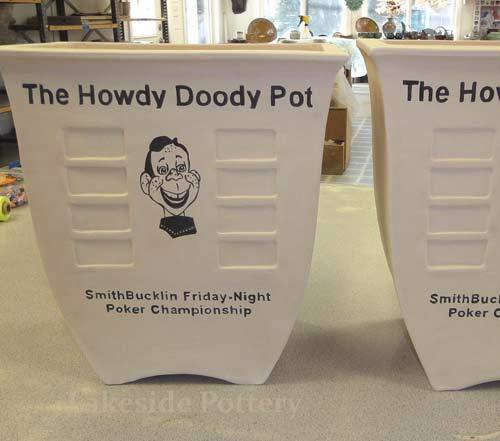 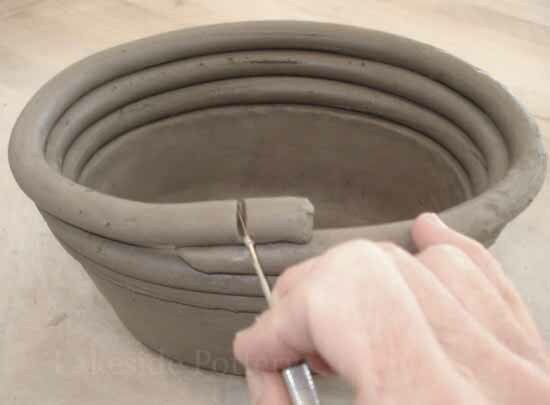 If the pot does not dry evenly and slowly, the one inch movement will create a crack some place in the pot most likely in one of the rim's top corner. 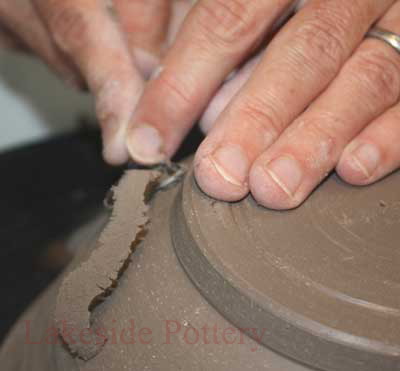 More about drying and firing pottery.